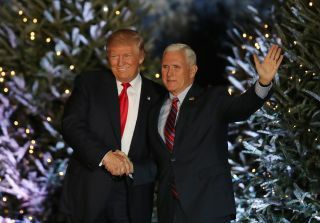 President-elect Donald Trump and Vice President-elect Mike Pence appear together during a stop on his 'USA Thank You Tour 2016' on Dec. 16 in Orlando, Florida. The Trump administration has expressed interest in reviving the National Space Council, which the vice president traditionally chairs, to oversee U.S. space policy. As the incoming administration of President-elect Donald Trump kicks into high gear, the future of the country's civil and military activities in space is on the table. Late in the 2016 presidential race, the Trump campaign aired the idea of relaunching the National Space Council (NSC) to oversee U.S. space policy. When NASA was formed, the National Aeronautics and Space Act of 1958 mandated an aeronautics and space advisory group as a mechanism to help guide America's space agenda. Over the following decades there has been an on-again, off-again history of a National Space Council to serve the U.S. President. The idea of such a Council is seemingly in play again in the wake of the 2016 election. But just how politics, agency cultures, personalities, and budget constraints play nice with each other in 2017 – in terms of resuscitating a National Space Council – is anybody's guess. Under such a plan, the council would be established within the Executive Office of the President of the United States, and would likely be chaired by Vice President Mike Pence after the new administration takes office. But if a National Space Council were to be re-established, how useful would it be? Space.com interviewed a variety of space experts, both for and against the idea, to find out. U.S. President Dwight Eisenhower looking at a nose cone in the White House during a November 1957 television speech about science and national security. He judged that he did not need a separate council for space matters, handling those issues through the National Security Council. Apollo 11 astronaut Buzz Aldrin, the second man to walk on the moon, told Space.com that a NSC led by the incoming vice president would be "absolutely critical in ensuring that the president's space priorities are clearly articulated, and effectively executed." However, Marcia Smith, editor of SpacePolicyOnline.com, added a cautionary note. "A White House National Space Council can be useful if the president wants one and is willing to back it up when other White House offices, like the Office of Management and Budget, balk at its recommendations. If not, then it is a waste of resources," Smith told Space.com. Smith added that a National Space Council would be more effective if there were to be a positive relationship between its personnel and those in the departments, agencies and industries whose activities it is seeking to coordinate. "Adversarial relationships will undermine the entire enterprise," she said. At the height of the "space race," U.S. President John F. Kennedy found a Space Council viable, and with the Vice President as its chair. Attempts by the Space Council to develop a comprehensive statement of national space policy were not successful, with the Council staff apparently not exerting any influence on defense and national security space issues. A few years ago, Schmitt proposed dismantling NASA and advocated the creation of a new, National Space Exploration Administration (NSEA). An NSC chaired by the vice president, Schmitt said, "might add clear White House support for the program, but it also probably would add another layer of bureaucracy on top of the [Office of Management and Budget]." During the tenure of U.S. President Johnson, Vice President Hubert Humphrey was tagged as chairman of the Space Council in 1965. Humphrey advocated for better use of the space program as an instrument of foreign policy. During his visit to the Marshall Space Flight Center in June 1967, Humphrey was briefed by center director, Wernher von Braun. John Logsdon, professor emeritus of political science and international affairs at The George Washington University's Space Policy Institute, has debated the idea of whether a National Space Council is necessary. According to Logsdon, the idea of a National Space Council to coordinate U.S. civilian, defense, intelligence and commercial space activity is far from new. It was tried from 1958 to 1973, he said, and then again from 1989 to 1993, and did not demonstrate enough value to be made a lasting part of the institutional presidency. Obama raised the idea again during his 2008 presidential campaign, but it never came to be, Logsdon added. Requested by U.S. President Richard Nixon. Vice President, Spiro Agnew, headed up a "Space Task Group" to review the nation's space future. Shown here is Agnew congratulating the launch control team after liftoff of Apollo 17 in 1972. Earlier, Apollo 8 astronaut, Bill Anders, in June 1969 was appointed as executive secretary of the Space Council, with a mandate to revitalize the organization. But in early 1973, Nixon abolished the National Aeronautics and Space Council. Logsdon said many approaches to organizing White House space policy management are possible; most have been tried in the last half century. However, "a separate White House space council has not been successful in demonstrating its superiority as an organizational approach," Logsdon noted. "It seems to me that giving the National Security Council the staff it would need to play this coordinating role is a better option," Logsdon said, "since from the president's perspective, the U.S. space program is a tool of broader economic, foreign policy and security goals, and the NSC and its staff are best positioned to link U.S. space capabilities to those goals." Heady day on July 20, 1989, at the National Air & Space Museum in Washington, D.C. — a celebration of the 20th Anniversary of Apollo 11 and chosen venue for President George H.W. Bush's announcement of a proposed Space Exploration Initiative. In April 1989, President Bush created the National Space Council by "Executive Order 12675," chaired by Vice President Dan Quayle. Left to right, Chair of the National Space Council, Vice President Dan Quayle, President Bush, and the crew of Apollo 11, Neil Armstrong, Buzz Aldrin and Michael Collins. Also taking a hard look at the history and potential of a National Space Council is James Vedda, a senior policy analyst at The Aerospace Corporation's Center for Space Policy and Strategy in Arlington, Virginia. In a recent paper on the topic, Vedda reviewed the on-again, off-again history of the National Space Council. Space advisory groups in the Executive Office of the President "have produced mixed results, more negative than positive," Vedda wrote. "It should not be surprising that from 1958 through today, the senior management of NASA and DoD [Department of Defense] have not favored a National Space Council, viewing it as a barrier between themselves and the president that will do little more than slow things down." This relatively unproductive history, Vedda noted, "will be repeated if the administration establishes a space advisory mechanism that is too cumbersome, too far removed from senior decision makers, or poorly staffed." Vedda added that the effectiveness of such groups has varied depending on their organizational structure and staffing, the president's level of interest, relationships with Congress and relevant agencies, the events driving the agenda, and individual personalities. Senator Barack Obama as a presidential hopeful pledged to reestablish the National Aeronautics and Space Council, but no such organization emerged from the presidential transition. President Obama delivered a speech at the NASA Kennedy Space Center in Cape Canaveral, Florida on April 15, 2010, espousing a new course the Administration is charting for NASA and the future of U.S. leadership in human space flight. On the other hand, a National Space Council conducted properly "could go a long way toward efficiently setting goals and addressing issues that cut across the civil, commercial and national security space sectors, and therefore across several agencies," Vedda said. The determination of goals and priorities for space activities beyond low Earth orbit. The bottom line, according to Vedda, is that a space council in the Executive Office of the President "can be a boon if it works well — aligning policy and strategy across the civil, commercial and national security space sectors to serve national interests — or a wasteful exercise if it doesn't," Vedda wrote. Leonard David is author of "Mars: Our Future on the Red Planet," published by National Geographic. The book is a companion to the National Geographic Channel six-part series, Mars. A longtime writer for Space.com, David has been reporting on the space industry for more than five decades. Follow us @Spacedotcom, Facebook or Google+. Originally published on Space.com.